1. 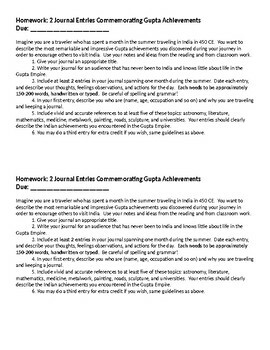 Journal HW on Gupta Empire: An assignment I’ve used as a homework assignment, but which could be adapted for classwork as well. Needed: reading on Gupta Empire achievement. 2. 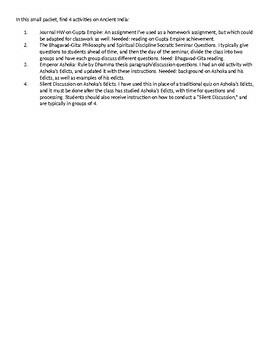 The Bhagavad-Gita: Philosophy and Spiritual Discipline Socratic Seminar Questions. I typically give questions to students ahead of time, and then the day of the seminar, divide the class into two groups and have each group discuss different questions. Need: Bhagavad-Gita reading. 3. 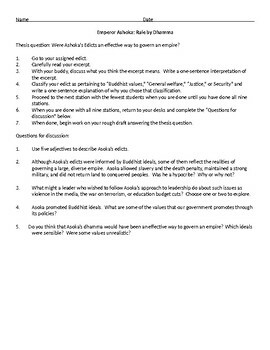 Emperor Ashoka: Rule by Dhamma thesis paragraph/discussion questions. I had an old activity with Ashoka’s Edicts, and updated it with these instructions. Needed: background on Ashoka and his Edicts, as well as examples of his edicts. 4. Silent Discussion on Ashoka’s Edicts. I have used this in place of a traditional quiz on Ashoka’s Edicts, and it must be done after the class has studied Ashoka’s Edicts, with time for questions and processing. Students should also receive instruction on how to conduct a “Silent Discussion,” and are typically in groups of 4.